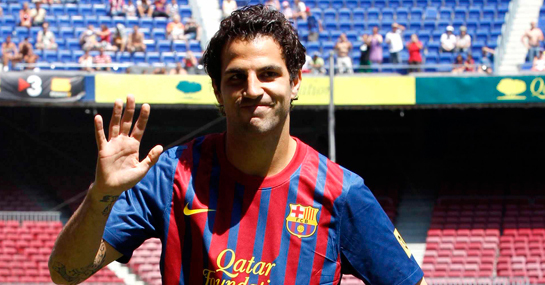 When Cesc Fabregas left Arsenal for hometown club Barcelona two years ago it appeared to be the perfect move for the former La Masia academy starlet. However, if rumours are to be believed then the dream could have turned sour for the 26-year-old with a host of Europe’s top clubs allegedly tracking the movements of the midfielder. Despite satisfying his urge to win trophies during his time at the Nou Camp – a thirst unquenched in the final six years of his Arsenal career – Fabregas has largely been confined to playing a bit-part role at the club. That may be understandable given the abundance of talent at boss Tito Vilanova’s disposal. While it’s no hardship to find yourself behind Andres Iniesta and Xavi in the pecking order, competition from the likes of Alex Song, Sergio Busquets, Thiago Alacantara and Javier Mascherano means Fabregas’ influence has been diluted somewhat. Add to that Vilanova’s propensity for fitting in Pedro or Cristian Tello alongside his central striking option, usually the imperious Lionel Messi or David Villa, and you see how squad rotation could be leaving Fabregas feeling cold. With still three years left on his contract the Spaniard is still 4/9 to remain at Barcelona beyond this summer. But a 7/2 return to Arsenal, the club who reportedly have first refusal on their former hero, might not appear to be too fanciful. Likewise, new Manchester United manager David Moyes is said to have targeted his midfield for special attention and the signing of Fabregas would act as a real signal of intent. The Premier League champions are priced at 5/1 to land the former darling of rivals Arsenal, while there would no doubt be plenty of other suitors. Meanwhile, Monaco have already flexed their financial muscle this summer, most notably by bringing in Radamel Falaco for £50 million. Although they’re the 16/1 outsiders to sign Fabregas, the ambitious project and lavish spending of Russian billionaire Dmitri Rybolovlev may appeal to a player who may find himself frozen out if he stays put.